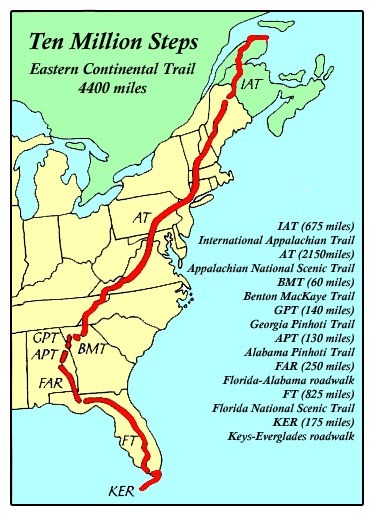 On New Years Day, the Nomad departed on the Florida National Scenic Trail from the Big Cypress National Preserve, near the Miccosukee Indian Reservation, deep in the Florida Everglades; bound for the AT and Baxter Peak, Maine, some 3,400 trail miles and nine months north, across sixteen states and most the entire eastern North American Continent! NOTE: The map below is from 1998 and no longer shows the accepted route. For a current map and descriptive outline of all trails, please click on the ECT/AMT Guide in the navigation bar to your left. But, why did he go? Indeed, what is it that lures the long distance hiker to “shoulder his gear” and “be hittin’ the trail?” What is it that beckons and draws us from our loved ones and from the comfort and safety of our homes to head off in all directions …“long gone,” into the rain and the cold and the dark and unknown? There’s a trail way up yonder I’m preparin’ to hike. It has no beginning or end. A’chasin’ rainbows ‘round the next bend. The Nimblewill Nomad had long marveled at the accomplishments of the likes of Earl Shaffer, Gene Espy, Warren Doyle, Grandma Gatewood and Dorothy Hansen. They all thru-hiked the AT. 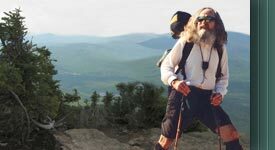 The book entitled Walking With Spring, written by Earl Shaffer in 1981, is a truly inspirational account of the first recorded AT thru-hike. The fact that Crazy One (as Earl is known to his friends on the trail) enjoyed the ‘48 spring season longer than anyone else on the continent…by simply walking along with the show, is absolutely intriguing! For you to see, by hiking north at the customary rate of 15-20 miles/day and departing Springer Mountain in early April, one progresses at about the same rate as the changing tilt of the earth-to-the-sun moves the spring season north, with spring lingering with you to finally bid farewell and move on somewhere in Virginia. But, spring starts much earlier the farther south you go; so does not the hand of this fair maiden belong to the suitor who begins hiking the earliest in the year and the farthest to the South? Indeed it does!